The golf world is all a buzz that the golf season has begun with the start of the PGA tour, the European tour, and the Champions tour (or senior men’s tour). But there is not much talk about the LPGA because the ladies season doesn’t begin for a few more weeks. In my opinion, I think many golf fans, myself included, don’t pay as much attention to the “official” start of the LPGA (this year begins with the ISPS Handa Women’s Australian Open). For me, the LPGA starts with the first major, The Kraft Nabisco Championship on March 29. The other tournaments I pay attention to, at least in terms of marking my calendar, are the other three majors for the women. It’s not that the women are any less talented than the men but there is less “excitement” in the non-major tournaments. Actually, the lack of excitement has the same feeling that the PGA tournaments had a few years ago — when Tiger wasn’t playing in many tournaments or playing well; and there were no young guns grabbing anyone’s interest. The LPGA has suffered since Annika retired and Michelle Wie, who got all the hype as the next “Annika”, could not live up to such unrealistic expectations. There are other great women golfers but the LPGA needs a “big star.” A “big star” is important to any tour — it’s the Annika and Tiger factor that make the average golf fan turn on the TV or buy a ticket to a tournament. When Tiger announced he would play at the 2012 AT&T Pro Am, ticket sales jumped 35%. Let’s hope 2012 is the beginning of the turning point for the LPGA because they have some really great talent in Yani Tseng (number one women golfer in the world who many believe could possibly break many of Annika’s records) and now the LPGA has their own young guns getting buzz. In particular, Lexi Thompson. Lexi Thompson has been called a “golf prodigy” and the proof was in her play last year when she won the Navistar LPGA Classic at the age of 16 as a non-member of the LPGA. Thompson was the youngest women to win any LPGA event. After her win she petitioned the LPGA to waive the age requirement (members must be at least 18 years old) to become a member. She was granted full membership. 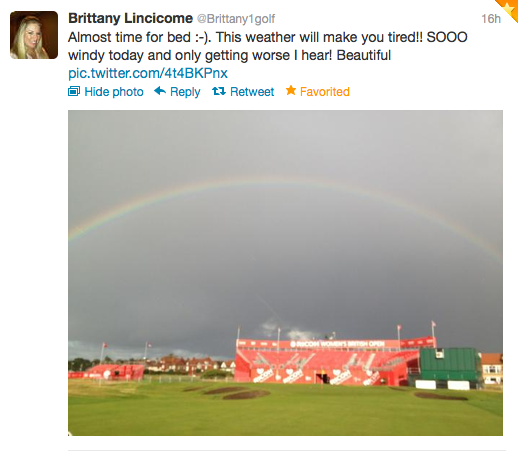 This just might be the year that I (and many other golf fans) pay attention to more than just the majors for the ladies.